Canada’s new $10 bank note will begin to appear in cash transactions late this year. Designed to stand apart, it’s the first vertical note issued by the Bank of Canada, and features the portrait of social justice defender Viola Desmond. As with Canada’s other notes, the new $10 has bold security features, ensuring that Canadians can use it with confidence. That’s why the Bank issues new notes – to stay ahead of counterfeiting threats and to keep pace with advances in technology. • Feel the smooth, unique texture of the note. It’s made from a single piece of polymer with some transparent areas. • Feel the raised ink on the front of the note, namely on the portrait, the word “Canada” and the large number ‘10’ at the bottom. • Look at the detailed metallic images and symbols in and around the large transparent window. • Look at the pattern in the eagle feather. Tilt the note to see the colour shift from gold to green. • Flip the note to see the elements inside the large window repeated in the same colours and detail on the other side. The new $10 note will be rolled out gradually and circulate alongside the other polymer $10 notes. 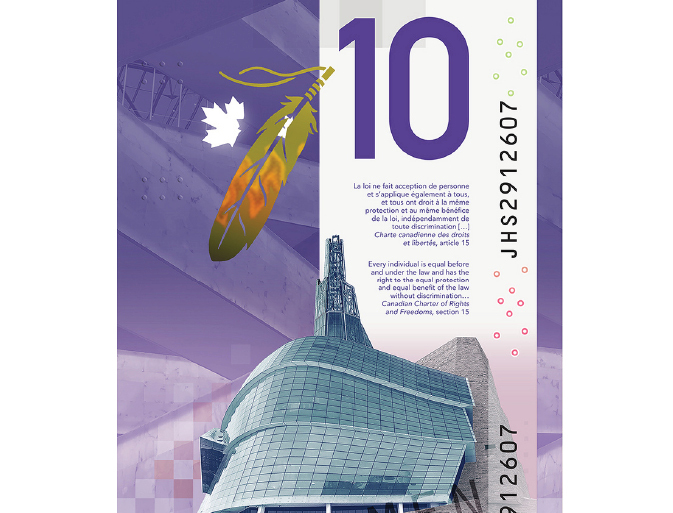 Unlike the special $10 note issued for Canada’s 150th anniversary in 2017, printed in a limited quantity to mark this historical milestone, the vertical $10 note will be the regular $10 note produced for years to come. Business owners may be wondering what this new $10 note means for their cash-handling equipment. The vertical $10 has been designed to minimize the impact on the cash-handling industry and maintains the same functional features as current polymer notes. Equipment owners and renters should contact their suppliers with questions about machine compatibility. With the release of this new $10 note, the Bank of Canada’s approach to issuing bank notes is changing. Rather than issuing all five denominations within a short time frame, a new note will be released every few years. This will allow the Bank to integrate the latest security features each time a new bank note is issued, ensuring that Canadians can continue to use their bank notes with confidence.